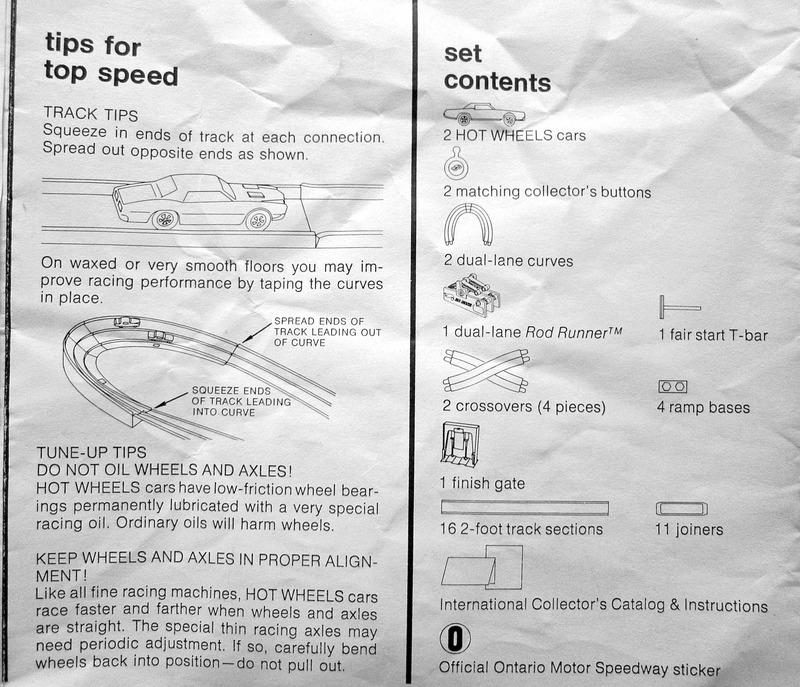 The 1971 Hot Wheels Ontario Trio instructions don’t show up very often on eBay. So here’s all the steps from 1 through 7. You can click on any picture to bring up a larger image. Front page. 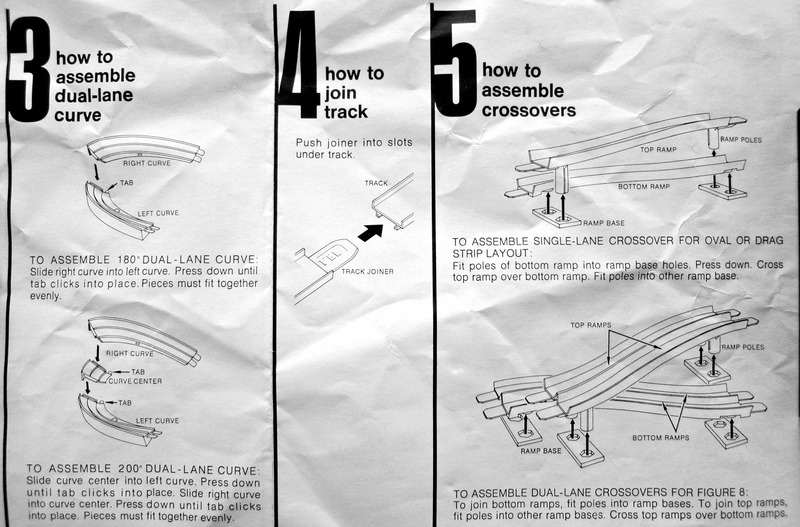 Copyright Mattel, Inc.
Steps 3, 4 and 5. Nothing left to do now but……Go Racing! It’s still fast. Still fun. This set, the Ontario Trio, is what got me started on writing this blog. When I was a kid I lived in, what could comfortably be called, the middle of nowhere. A little farming community of 800 souls taking up a tiny piece of the vast Canadian prairies. When Hot Wheels came on the scene in 1968 there were no stores in my town that carried them. Only when the family ventured to the nearby town of 3,000 people did I get to see these little cars and some of their accessory paks. But for the big track sets, it was only the rare trip to the big city, 1 hour away, that gave me a chance to see them. My Hot Wheels buddies were in the same boat. We had a loose idea of what was going on through Saturday morning TV commercials and comic book ads. 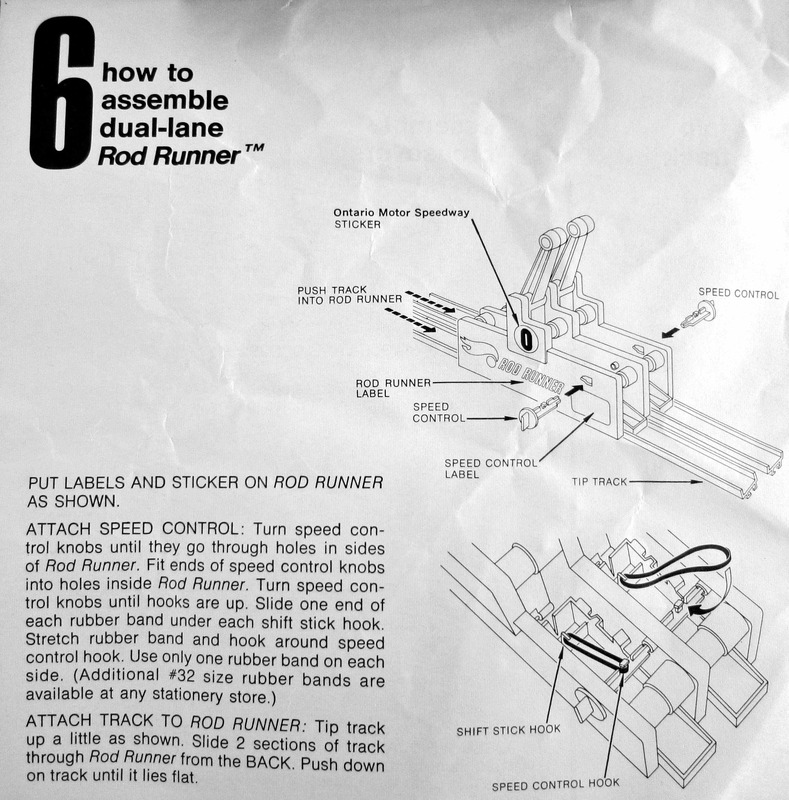 And we got more specific ideas from Mattel’s collectors’ catalogues. 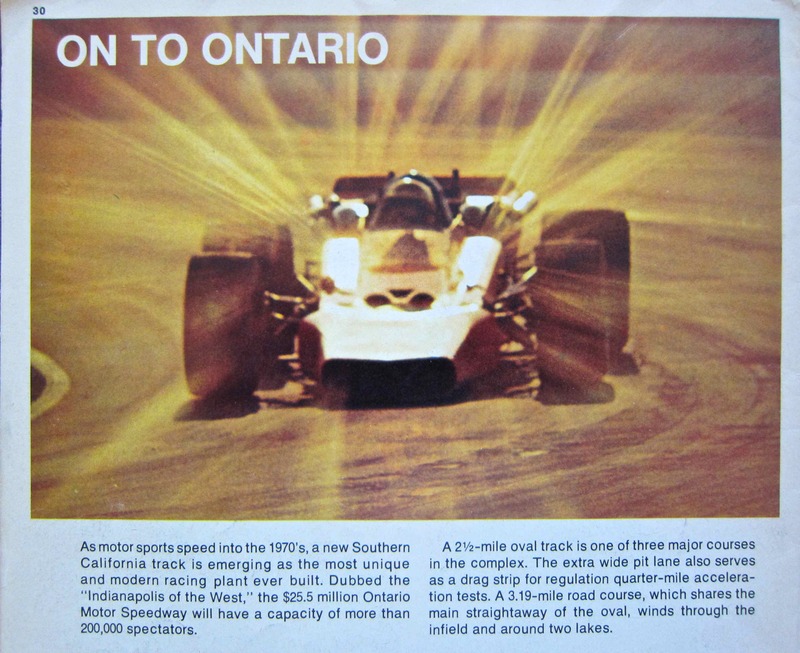 But the only time I ever saw something about the 1971 Ontario Trio Set was a preview on page 30 of the 1970 Hot Wheels Racing World Magazine. And what caught my eye was the real car on a real track. 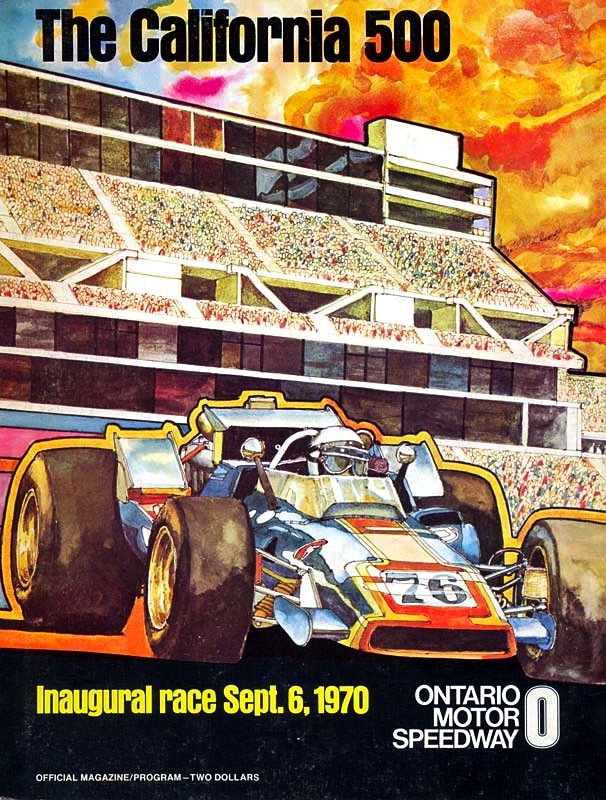 I was aware that Ontario Motor Speedway existed in southern California through broadcasts of racing events on ABC’s Wide World of Sports. 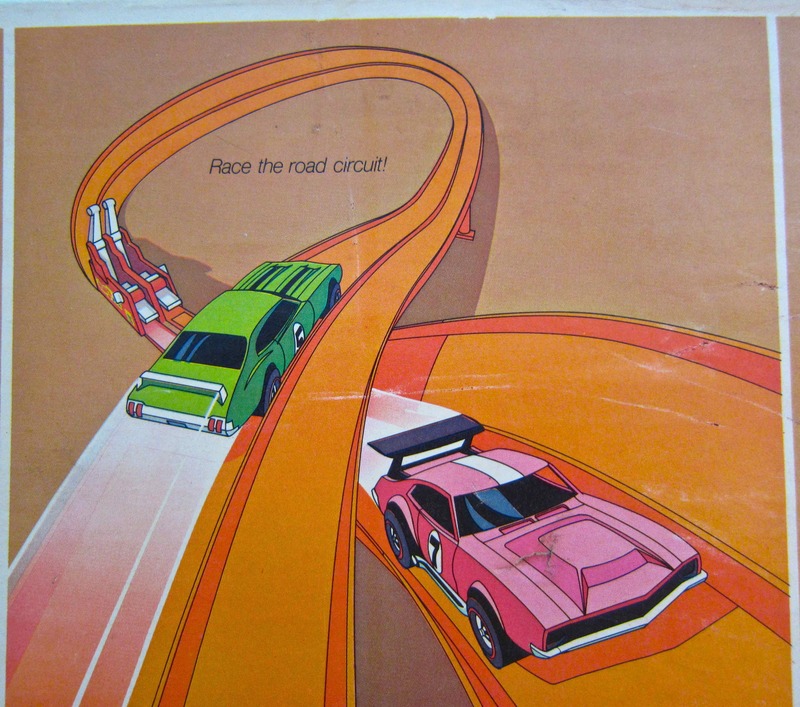 So this page made me think of the actual track and not a Hot Wheels Race Set. 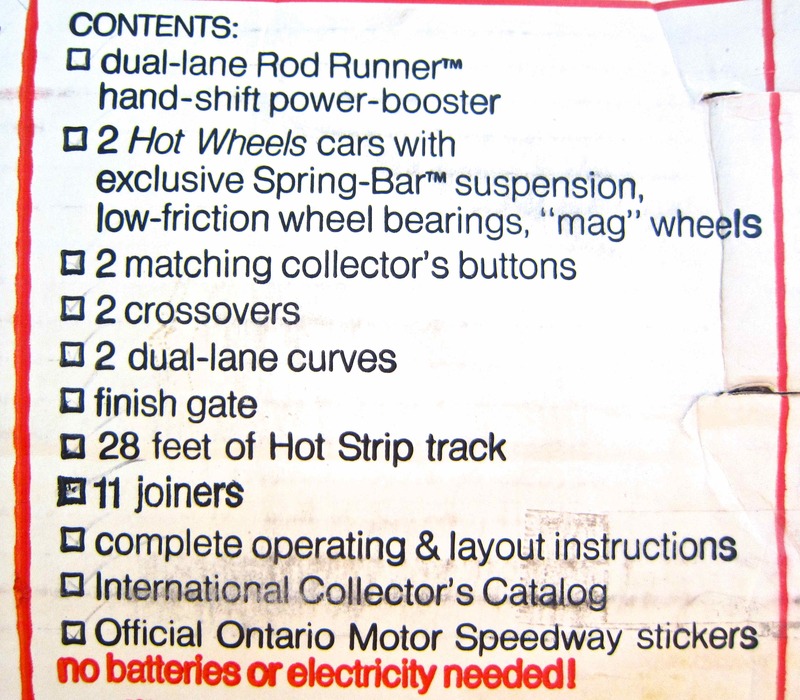 The bottom section of the page that talks about the Hot Wheels Ontario Trio Set doesn’t show pictures of the dual-lane Rod Runner nor the dual-lane curves. It was more like looking at an ad for the upcoming Crossover Pak. It did not help that Mattel’s TV track ads for 1971 were abysmal compared to the stellar TV track ads of 1968/69/70. 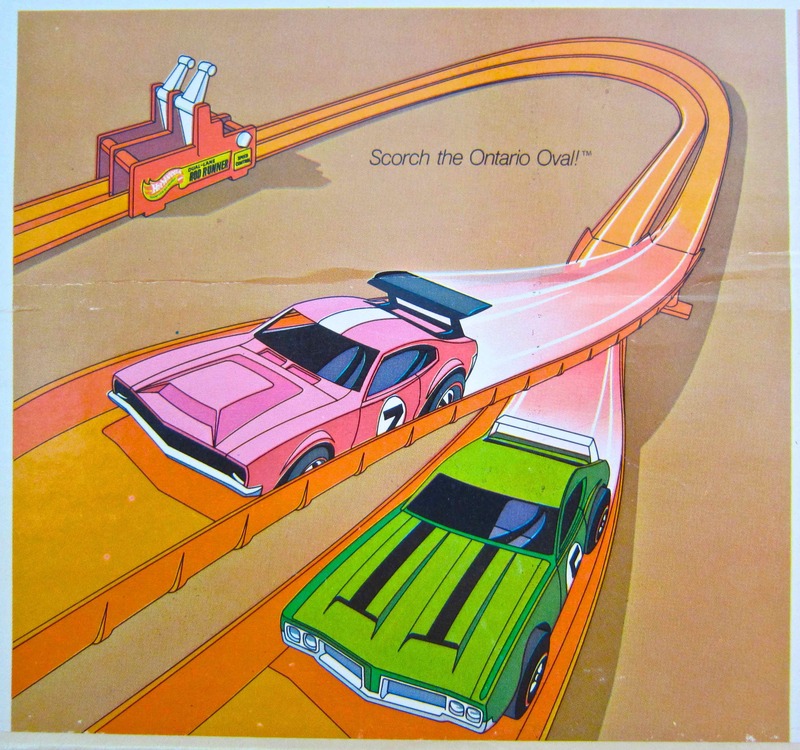 The only 1971 track ad that I saw showed 2 cars running on a side by side track with no start gate and no finish gate. 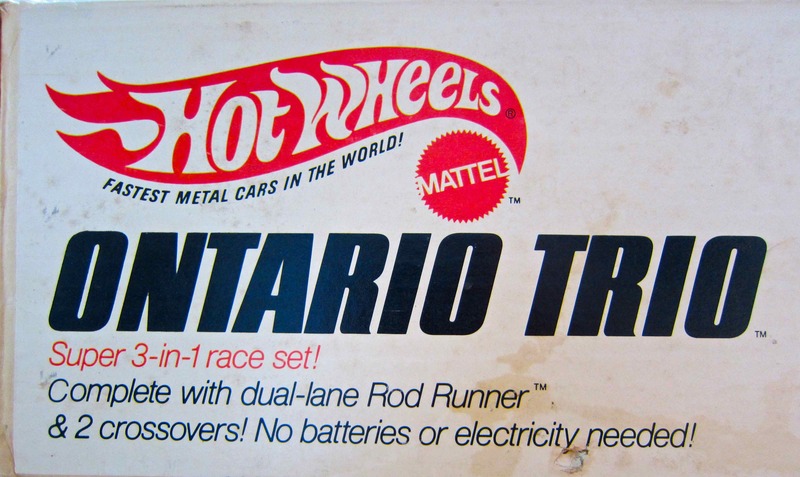 Since neither I nor any of my friends ever saw a Hot Wheels Ontario Trio Set, we had no experience with it. Even recently, as an adult, when I would see “Ontario Trio” in a 1971 track set list, I couldn’t visualize what it looked like. My early searches on eBay netted nothing. And a general search on the entire World Wide Web came back with hardly anything. It was only when I got to an auction site called Worthpoint that I saw a small picture of the Ontario Trio box. It was then and there that I finally realized this was a real Hot Wheels track set. 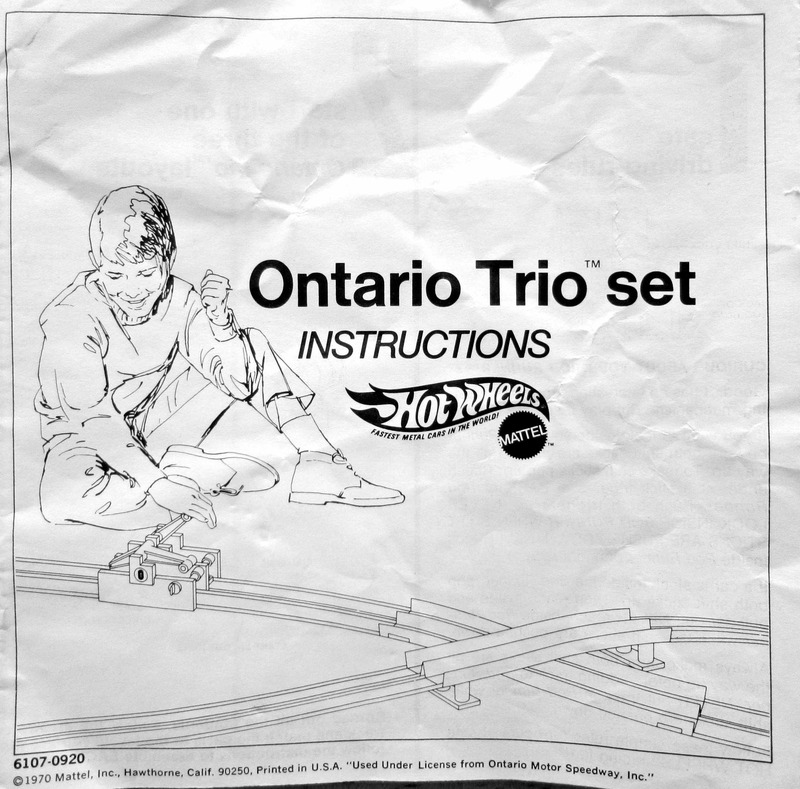 Complete Ontario Trio sets with all the track and instructions are still hard to come by. I had to build my Ontario Trio set by putting 4 or 5 separate eBay auctions together. Interestingly, I was the only person bidding on some of these items. But that made sense because few people know what this set is about and how it works. Here’s some box pictures of the Ontario Trio Set. 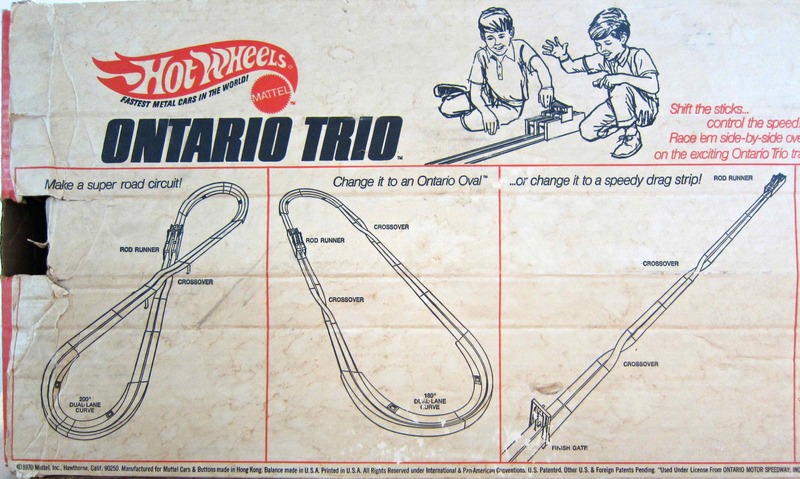 Ontario Trio box art – front. Box art – side. The Oval. A pink Mighty Maverick and a green Olds 442. Box art – side. The Figure 8. Box art – side. The Drag Strip. 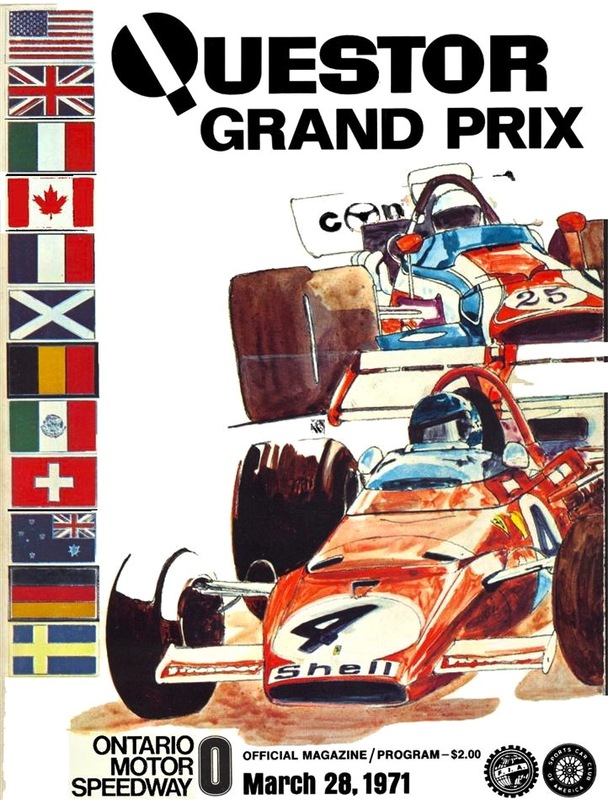 Box art – other side in red, white and black. Box art – back. 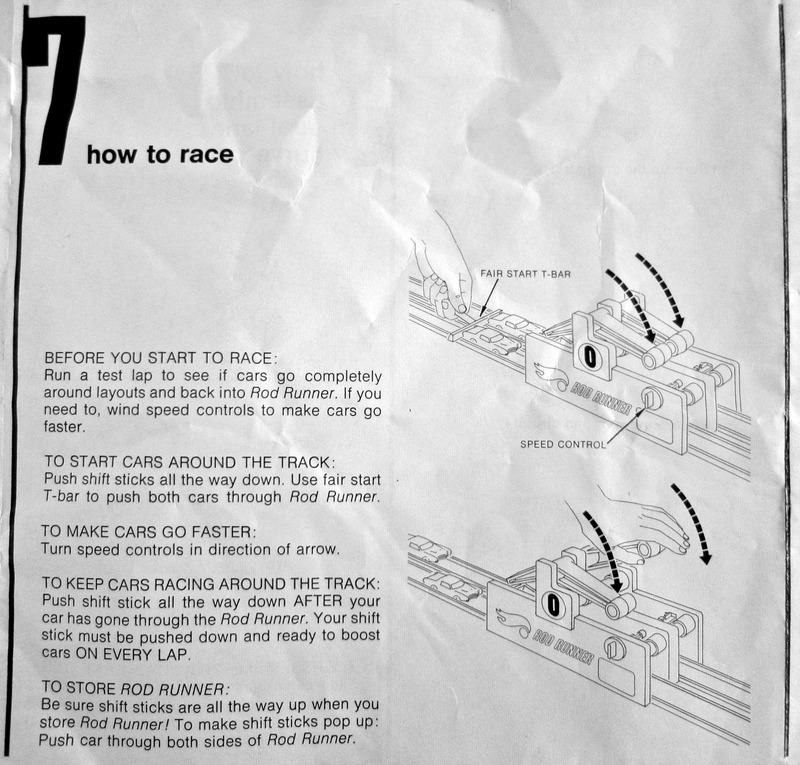 Figure 8 layout. Box art – back. 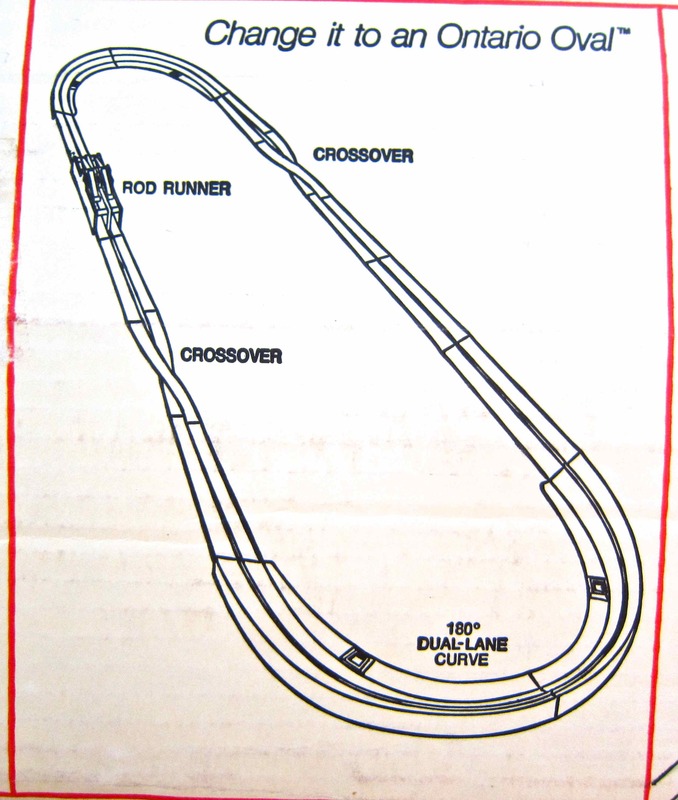 Oval layout. Box art – back. 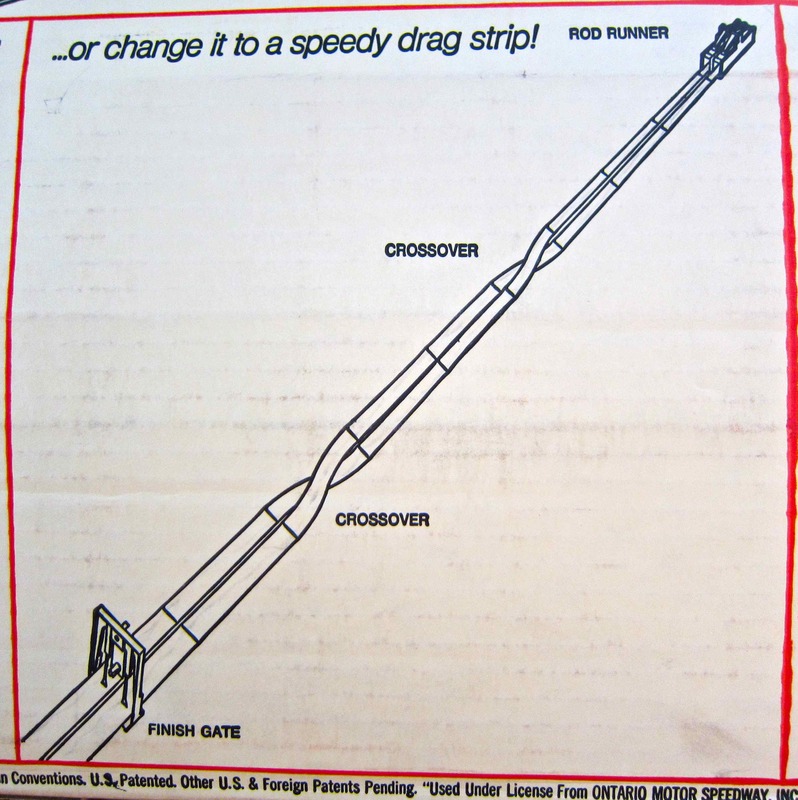 Drag strip layout. Back – contents. There is actually 32 feet of Hot Strip track in this set. 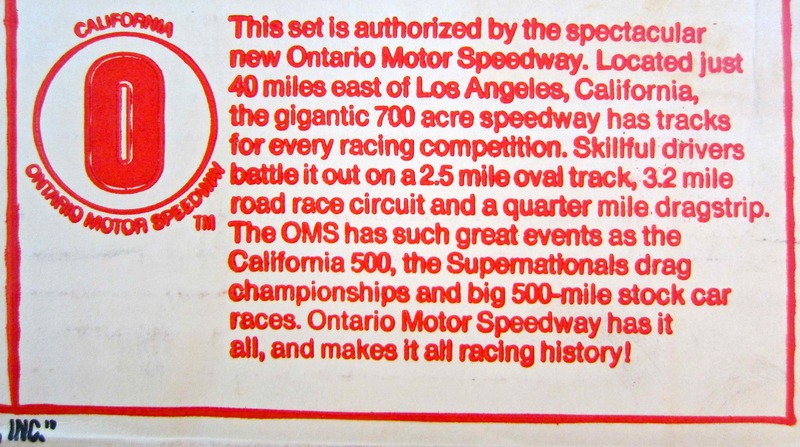 Back – Ontario Motor Speedway authorization and description. My plan is to set up 3 more blogs and 3 YouTube videos of the Ontario Trio Set in action. First, the oval which symbolizes Indy Car’s California 500 and Nascar’s Miller High Life 500. The first California 500. Courtesy http://www.progcovers.com/motor/ontario.html. 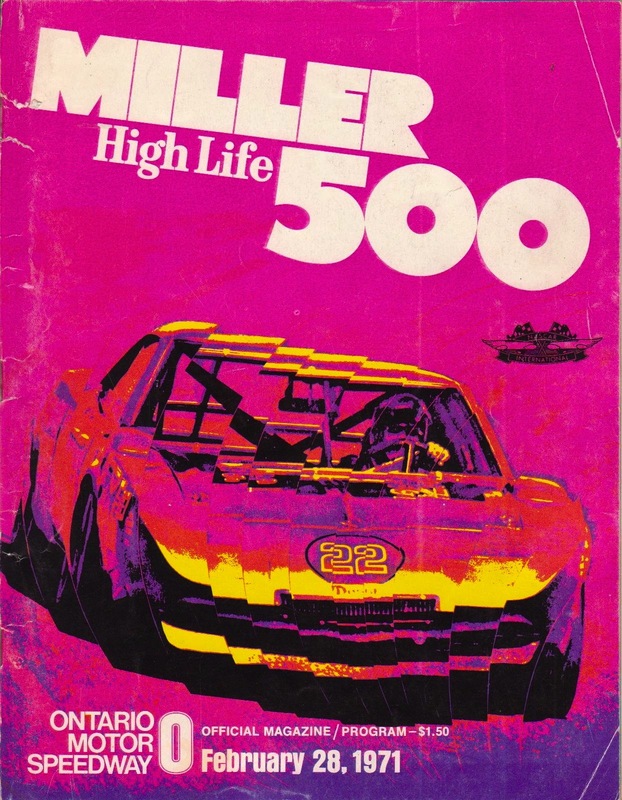 The first Miller High Life 500. Courtesy http://www.progcovers.com/motor/ontario.html. 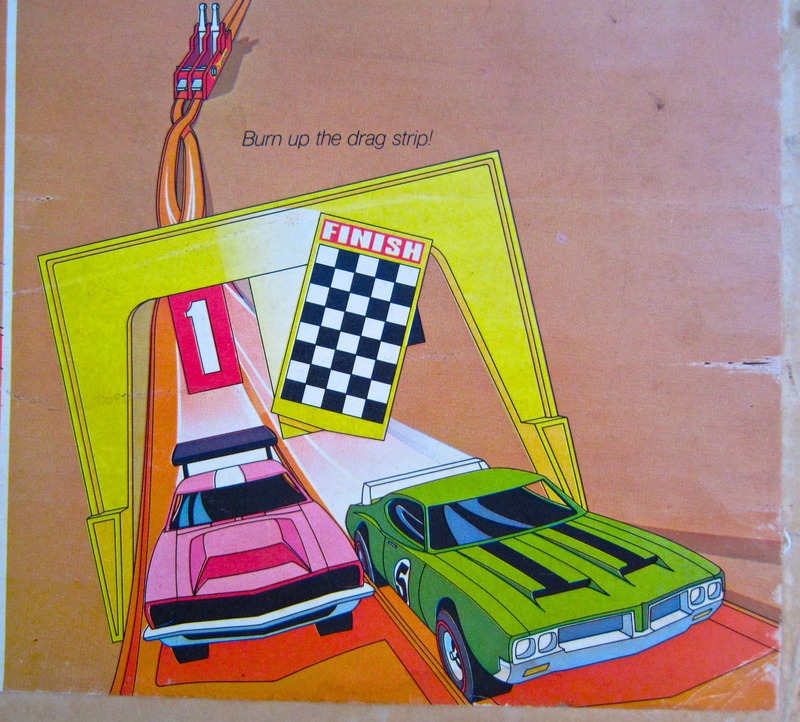 Second, the drag strip which harkens back to the NHRA SuperNationals. 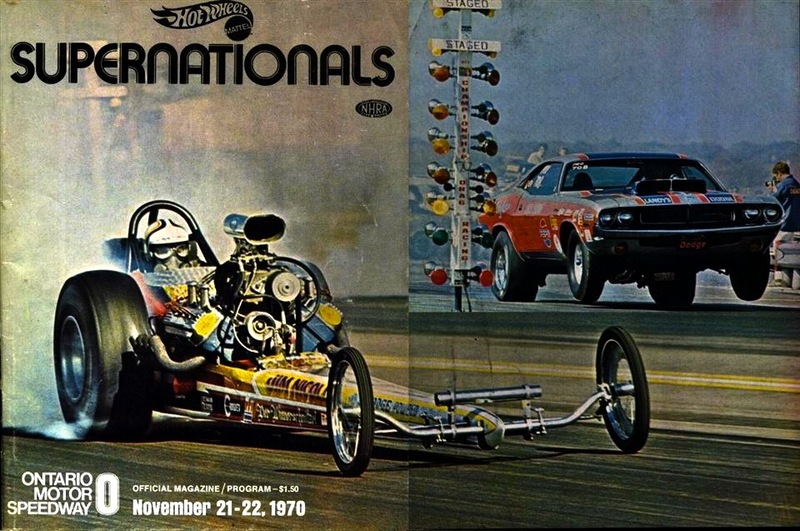 The first SuperNationals. Courtesy http://www.progcovers.com/motor/ontario.html. 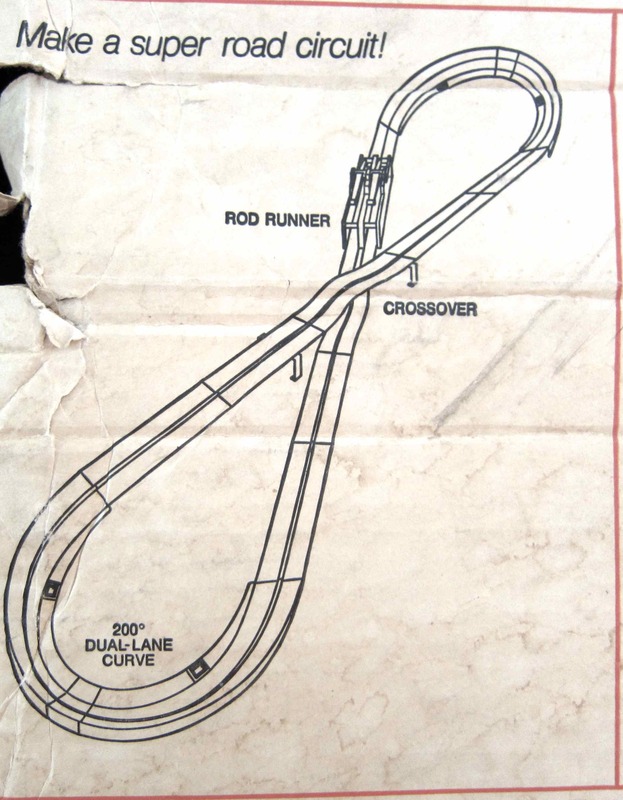 And third, the figure-8 which show cases Ontario’s inner race track that was used for Questor’s Grand Prix and Sports Car Club of America events. The first Questor Grand Prix. Courtesy http://www.progcovers.com/motor/ontario.html. 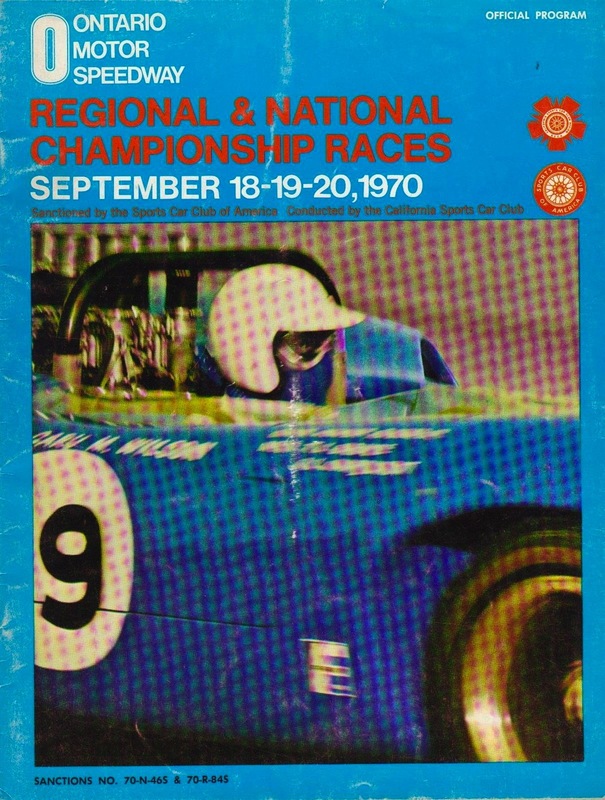 The first SCCA event. Courtesy http://www.progcovers.com/motor/ontario.html. 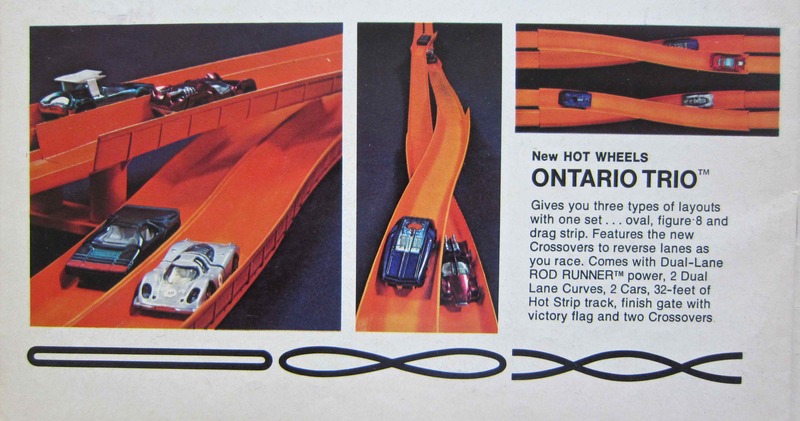 When finished, we’ll all know exactly what a running 1971 Hot Wheels Ontario Trio set is all about. And it is still fast. Still fun.